As of this writing, we are less than a week out from the release of Star Wars: The Force Awakens. I remember seeing the original Star Wars as a kid and being blown away with the rest of my generation. I can tell you about the theater I saw it at and the way it made me feel, but that’s a story for another article. Star Wars had funky sounding lasers, raggedy spaceships, and cool characters. What truly setsStar Wars apart from other sci-fi movies and shows is the lightsaber. 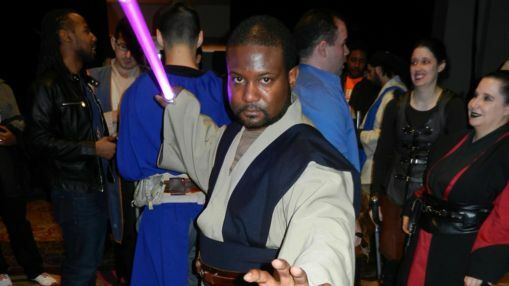 As a kid all I could ever think about was being a Jedi and having a real lightsaber. Over the years at various conventions, I would see cosplayers dressed like Jedi and Sith Lords posing for the convention goers in pictures creating classic battles between these two opposing sides. I was always left wanting to join in the fun. 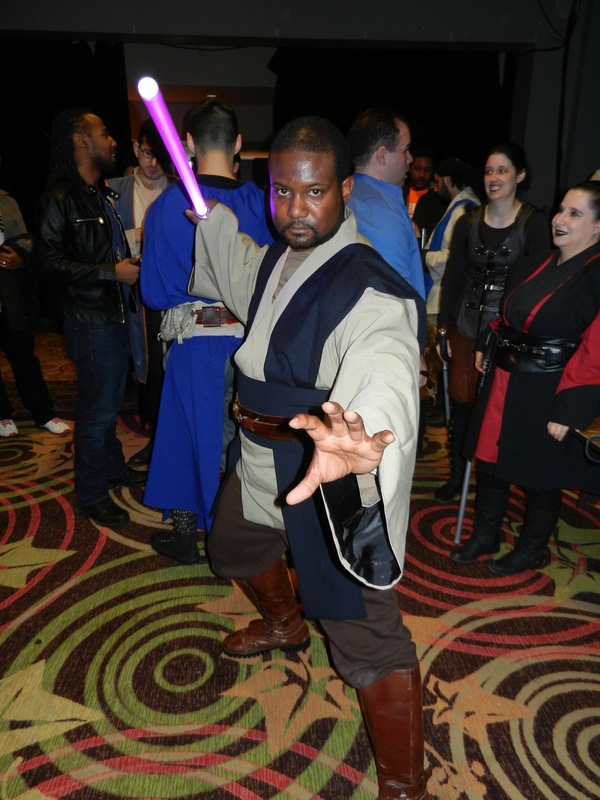 For 10 years New York Jedi (NYJ) has offered Star Wars fans the chance to come and express their love of the Force. After reaching out and meeting with some of the members of the NYJ at a recent performance at NYWintercon, I was invited to come up to their studio and watch a practice session. If you’re new to the group, one of the very first things NYJ lets you know is that they are not teaching you to go out and get into real fights. These classes are for gathering and having fun. 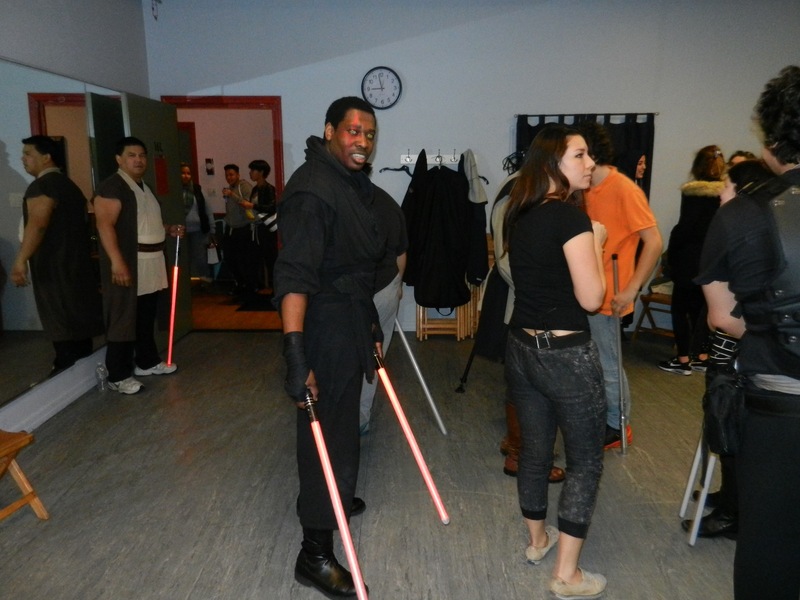 They are more like a stage acting school, where members are there to have fun as they travel the path of the Force. Members who come often work on their Jedi or Sith character, the look they want to achieve, their background story, build lightsabers, and create routines to perform in front of crowds at events like NYWintercon or NY Comic Con, like any good Force user does. The night I journeyed to the studio, located on the West Side of Manhattan, the 2 hour class was packed with regular members, a group of walk-ins, and other members of the media looking to work up a story for the upcoming movie. Excitement for the upcoming films was high in the room. Costumes aren’t necessary, while participants normally dress in workout sweats, but that night was special with all the cameras present. And it wasn’t just for fanboys, as close to half the class was comprised of women. In one instance, one of the participants, a fan of the franchise, was brought to the class as a surprise birthday present by her friends. 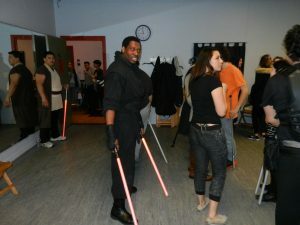 For $10, the class started with handing out lightsabers for the walk-ins. The lightsabers that NYJ members use are made out of polycarbonate and use regular AAA batteries, so that they can be used in mock combat and not shatter after repeated hits. That was followed up with some warm up stretches and yoga positions before the real fun began. Th e night’s lesson was an introduction to the basics of Shii-Cho or Form I, one of the styles of stage fighting that was developed based off of the movies and book literature. 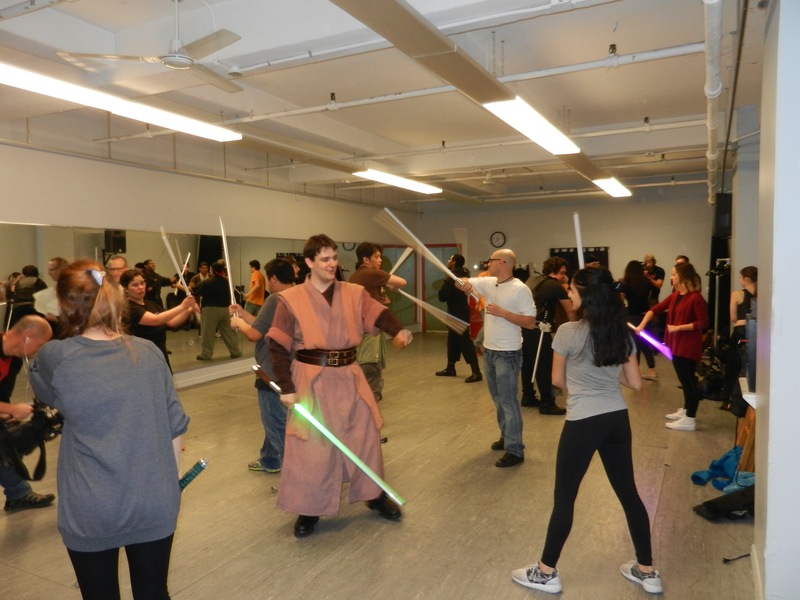 Led by Daniel, aka Jedi Magnius, the class soon learned very basic fencing positioning and footwork that was followed by instructions in choreographed sword play. Newbies were paired up with regular members to help them get the hang of the number and letter system used to keep the mock combat safe for all, because polycarbonate hurts. Like Fight Club, if you are new to NYJ, you fight at the end of the lesson. Participants are given 45 minutes to come up with their own fight choreography to perform at the end of class. Some of the members clearly have a background in martial arts as made apparent with spinning leg kicks and high karate jumps, but it was made clear that the NYJ is not a martial arts group, so don’t come expecting to learn how to fight. 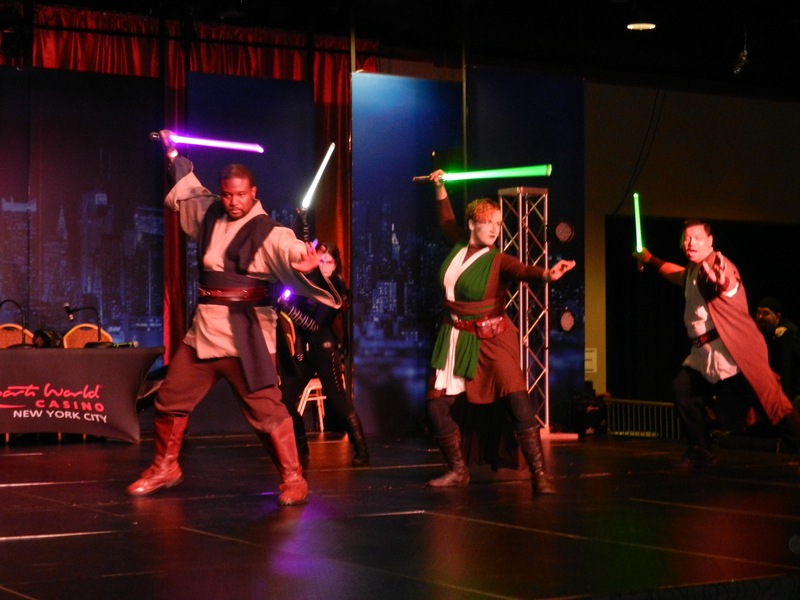 As newbies finished their first choreographed lightsaber battle, the group would yell out “first fight. 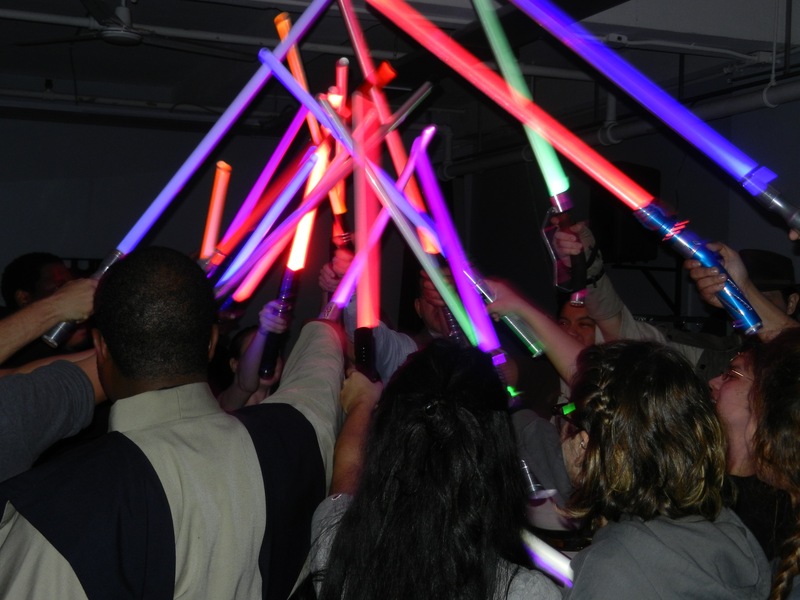 The night ended with warnings to members who have midnight tickets for The Force Awakens to not spoil the movie online, and a group huddle with lightsaber blazing. I know one of the things I’ll be doing for my bachelor party. May the Force be with you. Head here for more information about the NYJ. George Carmona 3rd is an Artist/Designer, former Milestone Media Intern, former DC Comics paper pusher, book lover and lifelong comic geek. You can find his work at FistFullofArt.com or follow him on twitter @GCarmona3.